There are many, many accusations being tossed back and forth between Apple and Samsung. There have been for months, there will continue to be. But perhaps none of them has perfectly distilled the fight that the two megacorps are having quite like Samsung's Chief Product Officer Kevin Packingham did in an interview today with Wired. It's a matter, you see, of rectangles. "For us, it's unreasonable that we're fighting over rectangles, that that's being considered as an infringement, which is why we're defending ourselves... Consumers want rectangles and we're fighting over whether you can deliver a product in the shape of a rectangle." 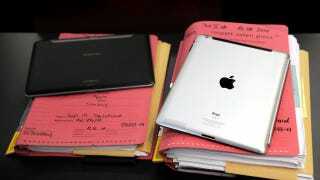 What does Apple expect Samsung to do, make a trapezoid tablet? A rhombus? Actually, yes! Cupertino has a patent, as silly as it may seem, on a flat rectangular computing machine. It's ridiculously broad, sure. But it exists. And in Apple's mind, it has every right to defend that patent. At the same time, Packingham's certainly got a point; if HP had patented a clamshell laptop design and defended it as aggressively as Apple has the iPad, we'd all be typing on Pavilions right now. And what kind of world would that be?